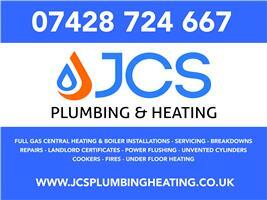 JCS Plumbing and Heating - Central Heating Engineer, Plumber based in Chesterfield, Derbyshire. Invoice history based on 168 reviews. JCS Plumbing and Heating was formed in 2005 by an ex military Royal Engineers. My aim is to provide an honest and professional service to domestic households. JCS Plumbing and Heating are boiler specialists who can undertake all types of plumbing and heating installation work. Just give us a call for a thoroughly professional service. Gas Central Heating - If you're looking for a more efficient way to heat your home, get in touch with us regarding your gas central heating or boiler. Much better energy efficiency makes this a great investment for your home. We're Gas Safe registered, so you can be confident we're a business you can trust.